Dajjal is not a literal person. It is a warning about religions other than Islam (95% of other religions are derived from Horus). It is really sad that Adnaanshaikh195 doesn't see it and resort to useless illogical arguments like "oooh bogus look spreading misinformation scholars don't agree" well guess what? Think for yourself! The scholars think it's gonna be this one eyed alien with a magic rod that will hypnotize everyone and control weather while no one is noticing! Well, there's too much shirk in there. Only God is omnipresent, I do not see how you can believe Dajjal will be 'everywhere' as a single person. Isn't God also anthropomorphized in the Qur'an? It's so it makes sense to people who don't understand! Oh and if anyone wants to criticize, please keep it to constructive criticism, not useless nonsense like "seriously, stop with your sh***y theories"
Let's take a look at all the 'prophecies' about Dajjal to prove my point! Once Allah's Apostle stood amongst the people, glorified and praised Allah as He deserved and then mentioned the Dajjal saying, "l [sic] warn you against him (i.e. the Dajjal) and there was no prophet but warned his nation against him. No doubt, Noah warned his nation against him but I tell you about him something of which no prophet told his nation before me. You should know that he is one-eyed, and Allah is not one-eyed. (Sahih Bukhari 4.553. Also, Sahih Bukhari 4.553, Sahih Muslim 41.7000, Sunan Abu Dawud 37.4318, etc). He IS one eyed, meaning present tense, it's NOT a prophecy of the future. Now one eyed, hmm let's see. Where do we see the one-eyed symbolism? Oh yea.. I've already explained this in other posts. 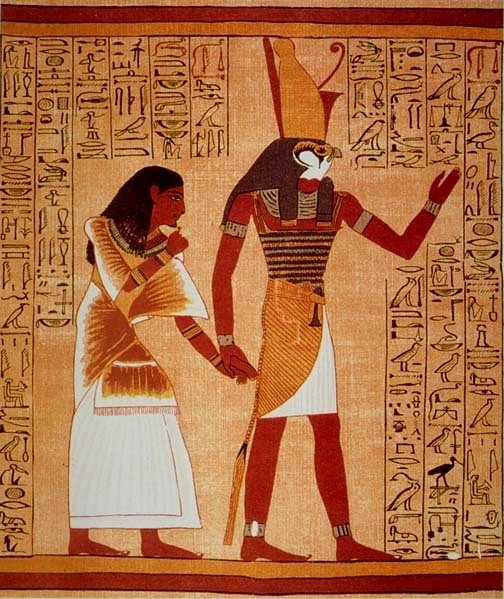 The eye obviously belongs to Horus, an ancient Egyptian personification (anthropomorphism) of the sun. The pyramid is clearly Egyptian. There are 13 layers on the pyramid. This represents Horus and his 12 apostles. The Roman numerals at the bottom of the pyramid are 1776, the year the 'establishment' took place. The text at the top is Annuit cÅ“ptis (also composed of 13 letters), which means 'undertaking/establishment approved' (in other words, mission accomplished). 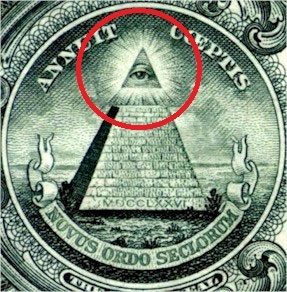 At the bottom it says 'Novus Ordo Seclorum', Novus means 'new', 'ordos' means order, 'seclorum' means world. So rearranged in English, it's a new world order. One example should suffice. I'm not gonna go into details of the great seal, don't bother looking it up, you won't need it. Oh and about the one eye, Horus' left eye represents the sun, and the right eye represents the moon. Moon worship died out in the past, but Sun worship, you have no idea.. It's obvious here that the guy just pointed to an ancient Egyptian painting of Horus, being red skinned. That's why they were all "who's that? Dajjal. Oh, looks like my friend Ibn Qatan. Hey, isn't that the son of Mary [Jesus]?" Horus chilling with 12 disciples, one of them being Scorpio (Judas), which 'betrays' the sun. Next: The believers will be able to 'read the kufr on his forehead'. Clever metaphor for people like me, who can already see through the deception. The ones that come now are the more obvious ones. They share amazing parallels with Horus. * Resurrecting the dead - Horus could 'resurrect the dead (crops)'. Obviously if you take the hadith on this literally (Sahih Bukhari 3.106) you are committing shirk. Christian Jesus could resurrect the dead, remember? * Weather control - One of the more obvious ones. When the Sun has fewer sunspots, it gives off less energy, less energy makes its way to Earth, and our planet cools down. Christians aren't allowed to enter Mecca/Medina today. Isa (PBUH) will metaphorically 'kill' the deception (Dajjal) by 'breaking the cross', or by telling the Christians he wasn't divine, he wasn't really the son of God. Lmao, I will prove you wrong, and refute everything I will say, I hate it when 'new converts' try to tell other muslims and interpret ahadith in their way, even though the points given are a load of crap. I will make a new topic. I actually made a wall of text before, but I did something wrong, So i lost it all, and was not bothered to retry to gather it all. Brother, the Dajjal is 100% a real person. He is someone that will come to us in the future first calling himself a savior, then a messenger, and then god himself. Allah will give him the abilities to control weather, cure incurable diseases and bring the dead back to life. Everyone agrees that he is a person and he will appear in the future. everyone is entitled to their own opinion, we are all muslims after all. And scholars agree on many different things regarding different topics. Scholars had differnt opinions on many things, some categorizing them in different places. Dialogue like this is healthy for civilization, because it helps us find the truth, and shows us whats right and wrong. If someone has a different opinion, you should respect it, but try to change his mind with dialogue. And we can ALL believe that no matter what "There is only one God" view is on the anti-christ, his still a muslim. I think that convert people have a better understanding of Islam. Aside from the conspiracy theories , devil worshipers , illuminits or whatever you call them , and Zionism , are you telling me that when the prophet peace upon him and the companions had doubts about the son of Sayyad being Dajjal , they mistook a human being for a system ?! The Dejjal is none other than Satan himself. Dejjall, is the Anti Christ, the Liar Messiah, he will claim to be God, then declare himself as the Messiah, Jesus. Dejjals Army, Gog and Magog and Jinns. Unknown Creations of transport...UFO...how the Dejjall, Satan will move fast?? Fabricated hadiths,....... Dejjall, Satan... can not and will not raise the dead, nor will he bring rain or make plants to grow, only Allah can do these things....Dejjall, Satan, will have a heaven and a Hell with him, and there will be the raising of the dead, but these issues are for a deeper understanding and comprehension of the Quran......though, the Hell will be the Planet Nibiru, called Saqr or sijjill, in the Quran. The time of the Planets arrival is called "The Hour", or mentioned as the "chastisement". I can explain more if you like, later perhaps. There is much in the Quran about the fabrications of hadiths by the Jews in the time of the Prophet, peace and blessings be upon him and his family. Another subject for another time. Please people , Dejjall is Satan.......and please realise many hadiths on Gog and Magog are false, as with Dejjall, as with many subjects concerning Islamic practices and the life of Muhammad, peace and blessings be upon him and his family. it can be possible Satan appearing as Dajjal or Dajjal is a being that is totally different than Satan. Based on the story narrated, we have false messiah killed. And Satan appears after that. Only the wicked people would survive and they would be as careless as birds with the characteristics of beasts. They would never appreciate the good nor condemn evil. Then Satan would come to them in human form and would say: Don't you respond? And they would say: What do you order us? And he would command them to worship the idols but, in spite of this, they would have abundance of sustenance and lead comfortable lives. .We are allowed to think and use our minds as Allah states many times as to the open and obvious deceptions of Satans and the Jews, which are all fore told in the Quran........I suggest you all start reading the Quran, and lay off the hadiths, they are misguiding you. I follow only those hadiths that make sense as regards in line with Quran, and by the wisdom of a dear friend of mine who is a relative of our Prophet Muhammad,peace and blessing be upon him and his family, am I able to know a few extra hadiths, that are not about Quranic matters. Dejjal is Satan and Satan is Dejjal, and yes he will be killed, by Jesus, or by Allahs Mercy, and that is the end of him and his followers. It cant be.Qur'an quotes iblees asking Allah time till last day to deviate humans, and Allah Almighty has given it.The end of the world is not on the day Isa (PBUH) arrives. Im not an Ahmadi, but the Ahmadiyya community agrees with you. Their prophet (Mirza Ghulam Ahmad) foretold that the greatest Dajjal is the Christian missionaries, where Dajjal isnt a single person but a system. After all, Allah dislikes hypocrites and polytheists the most. I agree with the notion that Dajjal being a single person is logistically improbable. Mohammad's (pbuh) dream was probably metaphorical.